As I watched today’s livestream of the Doom Eternal gameplay reveal from QuakeCon, there was a particular sound bite that stuck with me, delivered by Marty Stratton, the game’s director. It wasn’t anything regarding the versatility of Doom’s enemies or weaponry – I take these for granted when it comes to this franchise, and id Software games in general. Nor did it involve the surprise reveal of the campaign’s multiplayer functionality, which threw me for a loop. If it were any other franchise being discussed here, I would probably have an incredibly cynical take on such a declaration: Well, of course, we never let franchises die anymore, or something of the sort. But when it comes to Doom, I find the prospect of a lore-oriented universe married with the 2016 game’s combat mechanics positively thrilling, largely because the game strikes such a unique tonal balance between an action-packed hell-infused thrill ride and a hilariously tongue-in-cheek introspective look at the franchise’s own core tenets. I love that Doom, under Stratton and Martin’s direction, has returned to its roots as a series not only fully committed to its core premise (demons on Mars is an idea so absurd, yet so novel, I deeply wish I had thought of it first), but also willing to poke fun at the ridiculousness of that premise in all of the best possible ways. If 2016’s Doom was meant to restore the twenty-year-old franchise’s core tenets of fast-paced combat, satisfying weaponry and engaging enemies after Doom 3’s substantial departure in genre, then Doom Eternal seems as though it intends to combine the principles of Doom 2016 and 1994’s Doom II: Hell on Earth. Doom Eternal is clearly meant to evoke Doom II – if Stratton’s frequent references to “hell on earth” on the stage weren’t enough for you to get the point, I don’t know what will convince you – but the comparisons transcend the similarities in the games’ settings. Watching gameplay of Doom Eternal today, I was immediately amused by the manner in which the modern series’ evolution is so clearly mirroring that of the 1990’s originals. Doom II was simply more Doom – no significant leap forward in the game’s engine or gameplay mechanics, but compensating by adding in new weaponry, enemy types and environments to keep the gameplay loop fresh. Doom Eternal is, similarly, more Doom 2016. Doom II introduced the Super Shotgun to the franchise. Doom Eternal is introducing a new iteration of said shotgun, now including a bayonet-esque addition lovingly dubbed the “meat hook” by id staff. Doom II popularized the Arachnotrons, common demons that bear a striking resemblance to Doom’s final boss, the Spider Mastermind. The Arachnotrons return in Doom Eternal, along with the Arch-Vile, another Doom II enemy that deals damage via flames that move along the floor at rapid speeds. The parallels are constant. Yet, the inspirations for Doom Eternal go well beyond just Doom II. One of the first reveals of the livestream that brought a huge grin to my face was that the Doomslayer’s map now sports a way to track demonic presence throughout the level, the map slowly becoming blue as you clear arenas and corridors of “demonic corruption”. This immediately brought to mind the manner in which Doom and Doom II would conclude their chapters with a tally of items collected and enemies slain. It was a fantastic way of encouraging exploration, and I’m glad it’s making a return for Doom Eternal. I’m also encouraged by the manner in which the Doom Eternal creative team is approaching the game’s shift to Earth as its primary setting. Not only do the environments appear to be suitably warped, as though an infection is consuming the very surface of the planet, but the DoomSlayer’s armor has also changed: specifically, his biceps have been given room to breathe and his armor has adopted shades of muted brown around his hands and feet, creating a sense of a “boots-on-the-ground” aesthetic. I highly doubt that narrative is anywhere near the top list of priorities for the team at id Software when it comes to Doom, but these small aesthetic touches are appreciated. Even though Doom Eternal appears to be continuing the 2016 game’s trend of moving forward by reaching back into the franchise’s past, that doesn’t mean that the game’s developers are content with simply repeating that game’s greatest hits. One of the most interesting reveals of the stream was the aforementioned multiplayer component of the game’s campaign, in which players can become demons fighting against the Doom Slayer, invading another player’s game. I’ve heard comparisons to the multiplayer components of various Souls games today, but to me, what came to mind was Perfect Dark’s stellar Counter-Operative mode, in which one player would assume the role of protagonist Joanna Dark while another would jump between the bodies of various enemy NPCs, attempting to kill the protagonist before she could complete the mission objectives. While I doubt it’s a 1:1 comparison, the notion of being able to adopt the guise of one of Doom’s many diverse enemy types is an exciting one, and I look forward to seeing how it’s implemented. Equally encouraging was the most interesting weapon reveal of the stream, coming at its very end when the Doom Slayer, faced with an Arch-Vile, takes out what appears to be some form of demonic energy sword. Doom 2016 toyed with the notion of melee combat to the franchise with its Glory Kill system (also returning in Doom Eternal), and it’s clear that with the addition of this mysterious blade, the development team is now experimenting with the notion of melee weaponry as a concept – hopefully this will be paramount to continuing Doom 2016’s trend towards customizability in playstyle. 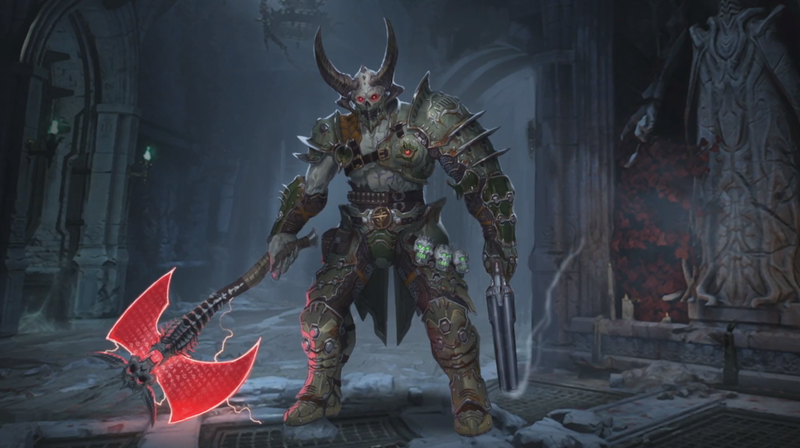 There wasn’t much revealed about any changes in the way weapon customization plays out in Doom Eternal, but dramatic additions to the arsenal such as this energy sword will encourage replayability, if nothing else. As interesting as what was shown during today’s gameplay reveal, what might be even more curious was what wasn’t shown: there was nary a mention of dedicated PvP multiplayer during the actual stream, although Stratton and Martin confirmed that it is returning in an interview with Polygon, describing it as “new” and “not an extension of what [they] did last time”. They also confirmed it would be developed in-house at id – Doom 2016’s multiplayer was outsourced to Certain Affinity. There was also no mention of SnapMap, Doom 2016’s proprietary map editor, although Escalation Studios, who developed that part of the game’s package, was announced to have been acquired by Bethesda today. Within the span of a thirty-minute gameplay reveal, Doom Eternal instantly shot to the upper echelon of my most anticipated games for 2018, and I could not be more excited to see how this one turns out. And remember – it’s not “Demons”.